This little whitetail deer fawn is taking a rest in a quiet summer meadow. His mother has left him alone to nap, and he is peacefully awaiting her return. This fawn reminds me of the scripture in Isaiah , "You will keep him in perfect peace, those whos mind is steadfast, because they trust in you." Our heavenly father will come back for us very soon. Despite all of the craziness in the world today, we have the promise of perfect peace inside. 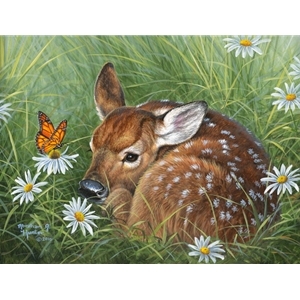 I hope each time you see this fawn, he reminds you to be still, and soak up the peace that surpasses all understanding. Exclusive Edition of 25 12x16 AP prints.